To provide a safe environment for our ticket holders and to expedite stadium entry at TCF Bank Stadium, the Minnesota Vikings will continue to enforce the NFL Bag Policy that limits the size and type of bags that may be brought into the stadium on game day. The NFL Committee on Stadium Security in May, 2013 unanimously recommended the implementation of this measure that enhances public safety and makes it easier for fans to gain access in all stadiums. It will be implemented at all NFL stadiums beginning with preseason games. 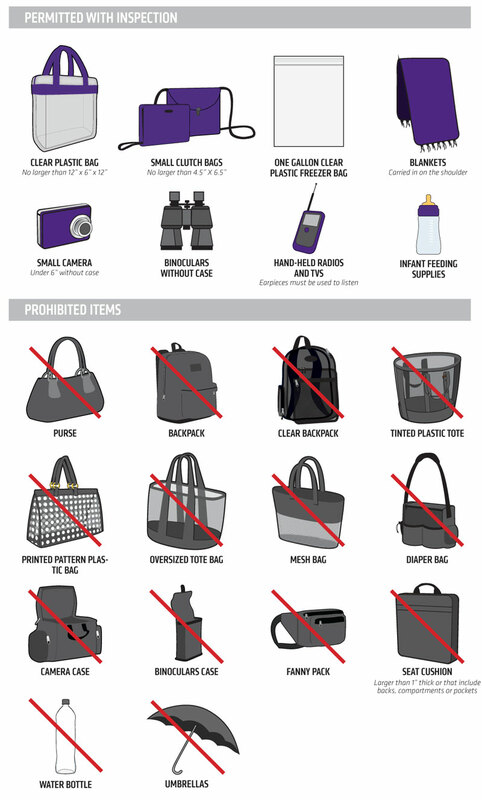 Prohibited items include, but are not limited to: purses larger than a clutch bag, coolers, briefcases, backpacks, fanny packs, cinch bags, luggage of any kind, seat cushions, computer bags and camera bags or any bag larger than the permissible size. For additional information, go to NFL.com/allclear. In recent years the Vikings have enhanced its already comprehensive safety plans with the additional measures such as pat downs, bag checks and metal detectors.